THE DROP IN the number of air travel passengers travelling through Irish airports in 2010 was the highest drop of any country within the EU, new figures have shown. 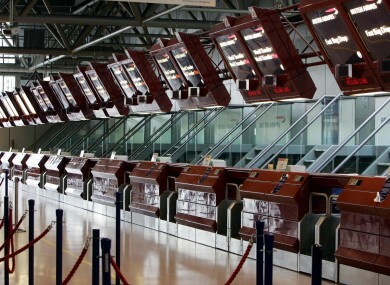 Data compiled by Eurostat shows that the number of passengers who travelled through Irish airports in 2010, at just over 23 million, was down by 12.1 per cent on the previous year – the largest fall of any of the 27 EU countries. Falling passenger numbers at Dublin Airport were largely to blame for the national drop; passenger numbers at the country’s largest airport, which opened its second terminal in late 2010, fell by 10.1 per cent to 18.4 million. The fall in Irish passenger numbers came in contrast to the trend across the EU as a whole, where the total number of passengers on flights rose to 777 million, up by 3.4 per cent on the previous year. Lithuania had the highest growth in its own air passenger market, with numbers up by 22.3 per cent to just under 2.3 million for 2010; Denmark also had steady growth, up 16.6 per cent to 24.3 million, while Latvia’s was up to 4.66 million (14.6 per cent). Ireland was one of only five countries to see passenger numbers fall in 2010, but the scale of its fall by far exceeded that of other countries: the next worst performer, Slovakia, saw passenger numbers by 3.4 per cent (to 1.9 million), while Slovenia’s fell by 2.9 per cent (to 1.38 million). Total passenger numbers in the UK fell by 2.8 per cent, to just under 193 million; passenger numbers in Greece dropped by 2.3 per cent to 32 million. Email “2010 fall in Irish air passenger numbers was EU's worst ”. Feedback on “2010 fall in Irish air passenger numbers was EU's worst ”.